Family Facts: Oldest of six kids, all of whom have participated in Global Encounters trips. Tim’s family has often hosted Global Encounters teams when flights have routed the groups through Florida. I never travel without…Extra clothing and a good flashlight. Me in 12 Words or Less: Artistic. Flexible and easy-going. Constant. I think in terms of the big picture. I grew up in sunny South Florida where I am used to warm weather and the beach. I am very grateful for my family, in which I’m the oldest brother of two sisters and four brothers. We enjoy going on extensive vacations together and traveling around the world. I’m a Florida landscape artist and you can see more of what I do at my website: timformanart.com. I also help with the family real estate business managing investment property. God has given me the passion to disciple and edify His children so that we may all mature into the knowing and likeness of our wonderful Lord Jesus. 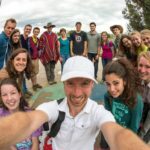 A Global Encounter Mission trip gives an opportunity to get out the box and to realize our need to totally depend on God. When you’re in a new place, with people you’ve just met, the food is different, and everyone is speaking a language you don’t know, all of your senses become heightened, and you tend to be open to hearing and seeing God like never before. Often, situations will arise that make prayer necessary and genuine. Short term International Missions has been a tool that God has used to make Himself more real to me and to help me mature in the Lord. Jesus teaches us to announce the good news, make disciples, and encourage one another in faith. This all flows from abiding in Him who loves us and gave Himself for us. And this is to happen at home or abroad. Missions is a tool—a tool to advance God’s Kingdom and bring recognition to our wonderful Savior and King.